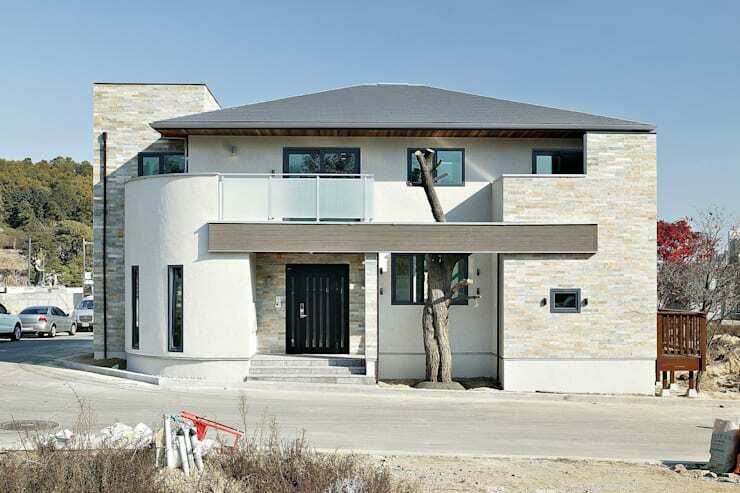 This stunning home in South Korea is brought to us by OUA Architects and showcases a serene and inviting construction nicknamed The Zen House. From the outset the home appears chic and modern, with its intriguing, pale facade drawing focus amidst a relatively traditional neighbourhood and, when exploring the interior, its easy to get excited about the range of fabulous finishes and sophisticated, modern furnishings therein. The home's interior is open and light, with kitchen, dining and living spaces combined to marvellous effect. Beneath the main stairwell is an opulent master bedroom finished in wood, with a small en suite peeping out from behind the bedroom's feature wall, dressed in a contrasting array of stone materials. The upper level consists of two enclosed rooms suitable as bedrooms or places for play or study, as well as a mezzanine floor, in which simple furnishings invite relaxation. The lower level of the home reveals a hidden treasure, with a subterranean floor having been constructed, dressed in pale tones and casual furnishings, and presenting another space in which the occupants can retire and relax. This amazing abode certainly lives up to its name, with its open, spacious and beautifully designed interior exuding a serene sense of balance. Take a tour below and tell us what you think! The exterior of this amazing abode is sleek and serene in various shades of white, with its facade variously comprised of rendered concrete and white brick. Darker grey tones are also featured amidst the pale palette, with the strips of stained timber constructing the home's deck visible beneath the angles of its tiled roof. 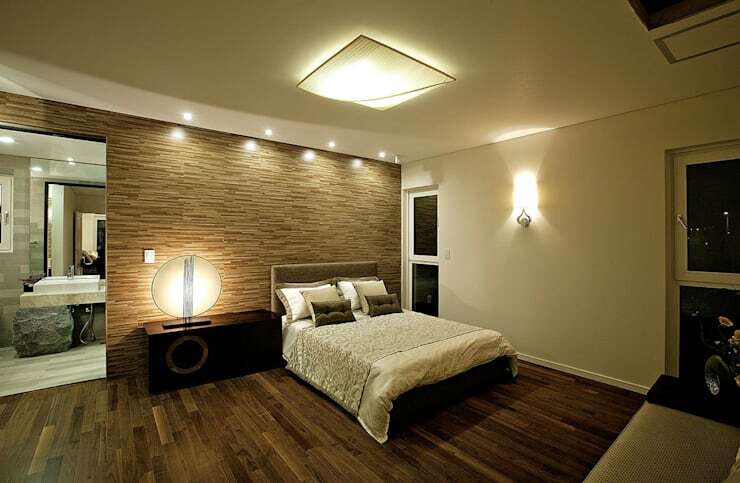 The aesthetic is sophisticated and striking, with the architectural appeal of this home definitely drawing the eye. Best of all is the gnarled tree trunk snaking its way upwards through an cavity in the deck, with its branches ready to thrive once more in springtime, bringing a new life and colour to the home's already engaging exterior. 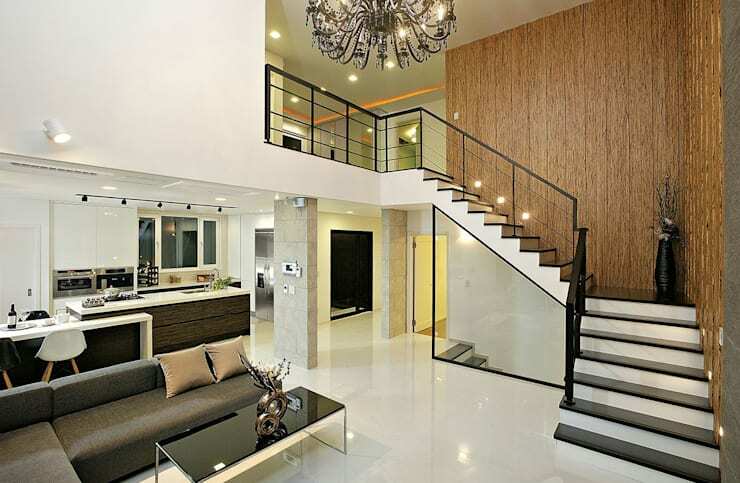 If you thought this home's facade presented plenty of architectural allure, the interior surely won't disappoint either, with it's spacious design and luxurious decoration a pleasure to behold. 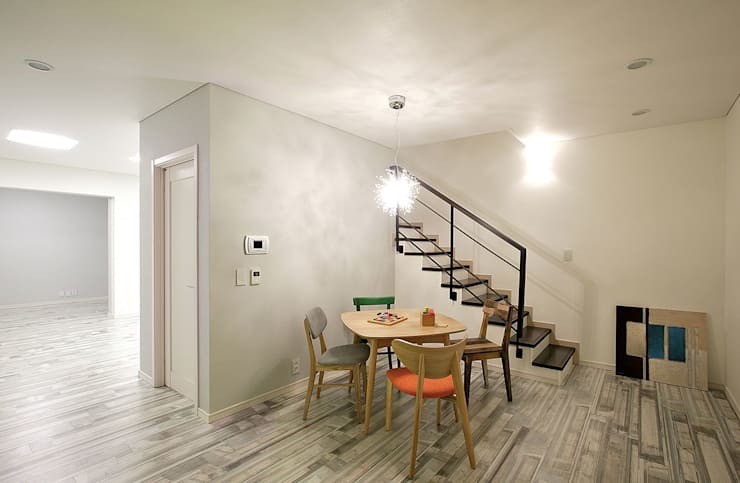 The interior architecture comprises multiple materials and finishes, from the shining, white floor tiles to the wooden panelling lining the stairway wall. A black chandelier dangles overhead for a taste of unrestrained glamour, with its dark finish echoed in the sheen of the black coffee table and steel trim of the stairwell. 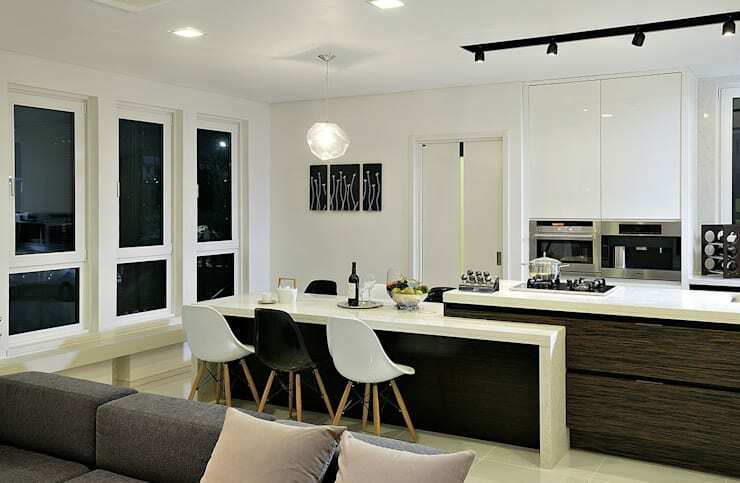 The home's kitchen is contemporary and sophisticated, with the bi-level bench seen here impressively transforming from kitchen island to dining table. The combination of polished, white stone and wood constructing the bench creates a beautiful contrast of colour and texture, emulated through the placement of black and white dining chairs around the dining table. The appliances included consolidate the contemporary edge of the space, with stainless steel finishes adding another shining, textural element to this sleek kitchen. The master bedroom is tucked away beneath the main stairwell, and presents a small enclave of warm, flowing wood and white decor. Streams of dark timber line the floor, grounding the space in their deep tone, while the far wall has been constructed of myriad, compact wooden slats for a lively, decorative effect. The bed and credenza are both of simple and stylish design so as not to overwhelm the decorative decor, while a private en suite peeps out from behind the timber wall, with the intriguing use of stone characterising the decor of that space, and providing a striking contrast of material and texture. From this vantage we get a true sense of open design of this stunning home, as kitchen, dining and living areas beautifully blend together, with the furnishings and decorative elements combining to create a sophisticated, contemporary synergy. A generous array of windows invite light and air to circulate throughout, while the upper level streams above the kitchen and dining space, inviting the occupants to enjoy an elevated view. Moving through to the upper level of the home and we find a small cluster of rooms, with two sectioned areas destined as bedrooms bordering an open-plan mezzanine area. Each upstairs space benefits not only from a generous array of windows, but a lovely view of the home's exterior. 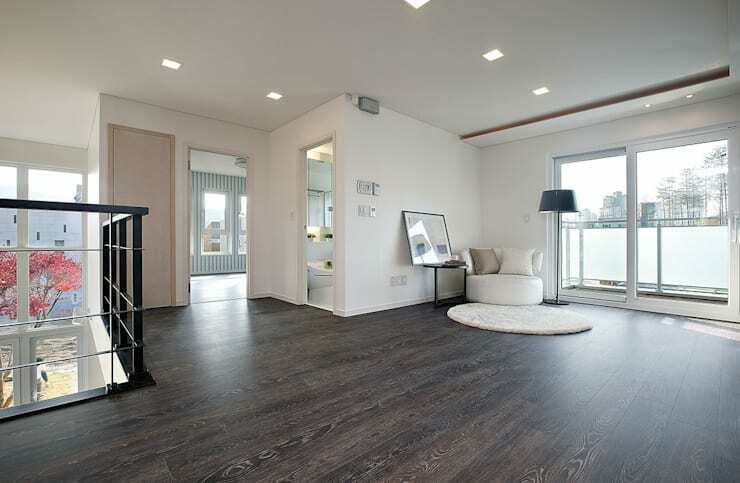 A second, smaller bathroom has been included on this floor for convenience, and a balcony flows beyond, providing an exclusive area for outdoor living. It's not just the upper level of this home that invites casual relaxation however, with a lower floor also having been constructed, housing a small space to which the occupants can retire for quiet, casual interaction. This simple setting provides a light-hearted locale in which to unwind with a book or board game, with the pale tones of the downstairs decor belying its subterranean locale, as light bounces about the walls and flooring with ease, creating an open and airy atmosphere. 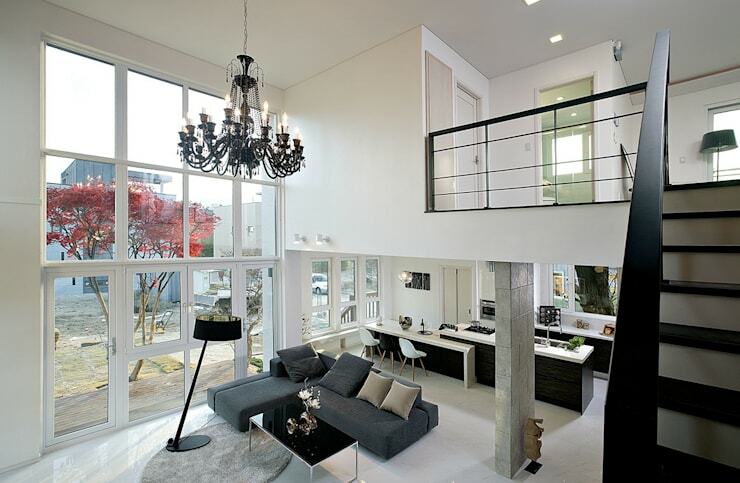 Did you enjoy the modern architectural allure of this stunning home? You should also check out The Artistic and Light London Loft for more inspiration! What's your impression of the Zen House? Tell us your thoughts below!